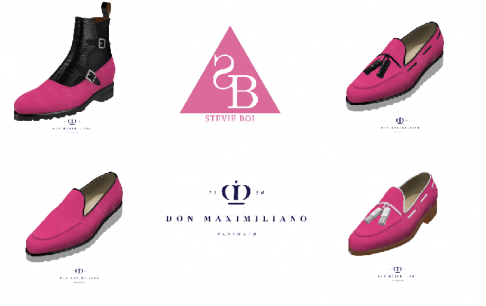 Stevie Boi Collaboration with Don Maximiliano will set the tone of luxury and customization. MILAN, Italy - June 1, 2018 - PRLog -- Fashion Designer has teamed with Don Maximiliano to to create a line of men and women's Luxury/Custom shoes. The shoe line will follow the direction of his current Spring/Summer Collection Entitled "PINK". The collection will debut during Stevie Boi's Summer Tour and also at New York Fashion Week in the Fall. "Our vision is to become the most important bespoke brand around the world with our 3D Design tool and our innovative processes to deliver luxury quality with up-to-date fashion style relevant to today's gentlemen who may find traditional bespoke labels very limited in their range and styles." Don Maximiliano is a bespoke shoes, bags & leather goods brand specializing in quality leather shoes for men and offering full customization with the World's best 3D Design tool for made-to-order and bulk orders. Founded and headquartered in Costa Rica by Vinicio Vargas, an innovative and passionate fashion entrepreneur. His love for art, music and bespoke fashion came together, and led him to create one of the most innovative 'Handcrafted shoes' companies in the world. Our bespoke products are all designed and hand-made by our craftsmen in our factory in Almansa, Spain; using only the finest leathers from the best tanneries in Spain and Italy, presenting the finest bespoke shoes with quality craftsmanship and our designer's style.